Here you'll find all of our unique honey spreads including our delicious Chocolate Honey, Cinnamon Honey blend and our Raspberry Honey blend! Scroll down to find all of our wonderful honey spreads. While renowned for its health promoting properties, Cinnamon Honey is more than just healthy - it will make your taste buds dance! Available in 330 gram glass bottles. Ingredients: Summer Blossom Creamed honey, cinnamon. "I have to thank you for such a great product. My breakfast is not complete without a slice of wholewheat toast and your cinnamon honey." 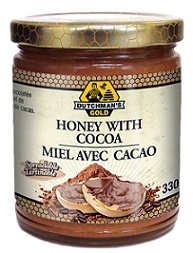 Our Honey Cocoa spread is the perfect blend of our Summer Blossom honey with 100% organic cacao. Delicious on toast, in hot beverages or in your morning smoothie! Summer Blossom Creamed honey, organic cacao. Available in 330 gram glass bottles, our Honey Raspberry spread is a blend of Dutchman's Gold Raw Honey and local, Ontario raspberries! Summer Blossom Creamed honey, raspberries.